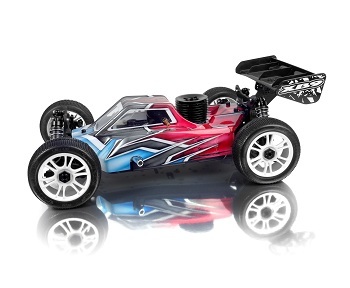 The XB9 is a typical XRAY car – a premium, professional, high competition model racing car for the most demanding racers, developed and designed with attention to the smallest details. Manufactured from premium European materials, machined using state of the art Swiss and German machines and backed by premium service & support, the XB9 is a typical XRAY, a luxury masterpiece. XRAY revolutionized the off-road category years ago with the introduction of the first XB8 which set new trends and standards for premium quality, reliability, service life and of course performance. Since the first XB8, the XRAY off-road racing cars have received honours and accolades across the globe, including multiple ‘Car of the Year’ awards from RC car magazines around the world as voted on by consumers, and countless victories at all levels of racing, including multiple National and European Championship titles. Over the years, XRAY off-road cars have established new benchmarks for premium quality, reliability and performance; traits which have won XRAY the loyalty of customers around the world. The 2013 XB9 chassis was completely redesigned to allow for updated weight distribution, and is both longer and wider to improve chassis balance and stability and to accommodate new center diff position. All screw holes on the bottom of the chassis are countersunk, allowing for a very smooth chassis underside with no protruding screw heads. The side guards have an updated design to compliment the new redesigned chassis. The tough composite side guards offer improved side protection, and fit perfectly to chassis to seal against dirt, and protect the fuel tank. The side guards are specifically engineered as a part of the Multi-Flex™ adjustment system. As part of the new chassis design, the engine and driveline components were slightly repositioned. The center differential mount was shifted slightly to allow the engine to be parallel to the chassis centerline and align the central drive shafts as straight as possible. The layout of the electronics was designed to focus specifically on weight distribution and balance. During the design and prototyping process, several different layouts were tested and evaluated by the factory team. Data from these testing sessions as well as their qualitative feedback was reviewed prior to choosing the final layout. The new fuel tank features an integrated floating stone filter that ensures that the fuel pickup will always be in the correct orientation, even if your car isn’t. This fuel pickup system will allow fuel to continue to flow to your engine, even while waiting for a marshal to reach your car and get you back on your wheels. The fuel tank is molded from special composite mixture which ensures very high reliability and rigidity. The molded-in splashguard protects the brakes from fuel spillage. The tank is mounted with rubber grommets to absorb vibration and small composite holders secure thick 5.5mm silicone fuel tubing. The new High-Torque Clutch is included and is a significant performance upgrade over previous clutch systems. The clutch provides a smoother and more continuous transfer of power from engine at very high RPM. The clutch engages higher in RPM range, resulting in more controllable power during acceleration, while still maintaining good handling and performance on jumps. The updated design and engagement profile also provide for extended clutch life. #358532 Flywheel – the new flywheel has smaller diameter but increased weight. Thanks to the smaller diameter the flywheel is more protected above the chassis so after huge jump there is a reduced chance for engine stoppages when the car lands on a rock or other obstacle. The increased weight of the flywheel results into more balanced operation of the engine. #358562 Clutch shoe (3) – the new clutch shoes are smaller, lighter and designed for engagement during the entire travel of the shoe. The shoes are less sensitive to wear and as such life time is increased. #358550 Flywheel Nut – Tough HUDY Spring Steel nut for securing flywheel to engine crankshaft. The new 16° caster blocks have been successfully long term used by the factory team in almost all conditions. The 16° caster blocks proved especially beneficial on rough and rutted tracks, where they added stability and made the car easier to drive through the rutty sections. The new caster blocks feature a new additional roll center position for the lower suspension mounting. The lower position is suggested to use for grippy and high traction track as well as for bumpy tracks. The upper position is suggested to use for slippery and smooth tracks. The chassis itself features an integrated caster angle of 10° which together with the 16° caster block creates a total 26° caster on the car. The suspension holders allow for a +/-2° caster adjustment as well. There is a variety of different optional caster blocks available for super fine suspension geometry adjustment. The 2013 steering blocks are all-new in design featuring increased steering angle for improved steering and corner speed and a new Ackermann position which provides improved corner speed. The super-lightweight composite zero kingpin steering blocks feature an inset aluminum bushing that is molded into the steering block itself, ensuring a lightweight, precise and durable steering block assembly. This enables the kingpin screws to be firmly held in the aluminum threaded bushing while the end of the screw is self-locked in composite to prevent the screws from loosening during racing. The molded-in aluminum bushings allow the steering blocks to turn freely ensuring precise steering reaction. The super-tiny steering blocks are molded from a lightweight yet very strong and durable composite material. The steering turnbuckles are shorter to accommodate the new steering block position. The front shock tower has been updated with new front roll center positions for updated suspension geometry and the rear shock tower has been redesigned to fit the optional longer chassis brace. Machined from extra thick premium-grade graphite, the shock towers are lightweight and strong. Front and rear shock towers include multiple shock positions as well multiple roll center adjustment positions. The rear shock tower also holds the wing mount. in mounting various muffler/header combinations. The XB9 is the world’s first 1/8 off-road chassis incorporating the Multi-Flex™ adjustment technology, which allows tuning the chassis flex for different track conditions. The more screws used, stiffer the car is and fewer screws used, softer the car is. Do not remove any other screw except those shown. The large molded radio box features a very clean design and layout that places the weight in key areas for proper balancing. The batteries are placed along the centerline of the chassis, and the lightweight receiver is placed on its side. The very easy-to-access radio box is mounted on the side of the radio plate and is released by only a few screws. The bulkheads have been designed for extreme durability, while still providing easy access for tuning and maintenance. Central differential with adjustable oil viscosity featuring 46T spur gear with standard 13T clutchbell on the engine. XB9 constant velocity drives (CVDs) are manufactured from world-renowned HUDY Spring Steel™. The drive shafts are some of the world‘s thinnest yet most durable drive shafts used in off-road cars. The central larger and stronger outdrives feature protective rubber boots, thick 3mm pins, and a protective locking ring. All drive shafts and outdrives are hardened with a proprietary hardening process to provide unbeatable lifetime and reliability. To reduce rotating weight, the super-lightweight diff outdrives are machined from HUDY Spring Steel™ material which allows additionally material to be removed from the outer part of the outdrives, further reducing the weight without effecting durability. The inner portion of the outdrives are additionally hand-ground for maximum precision and fitment into the diff case. Rubber-sealed composite differential housings feature steel inserts that are manually precision ground after the molding process to guarantee a perfect fit with no vibration. Differential internal gears are made from pressed steel, heat treated, and machined for ultra-precision and smooth operation. Clutchbells are available in sizes of 12T, 13T, 14T and 15T. From the suspension arms, through the suspension blocks, to the light, yet robust steering blocks, every suspension part has been specially designed for 1/8 off-road racing platform to provide responsive racing characteristics in all racing conditions. The aluminum suspension holders feature Integrated Suspension Settings (I.S.S.) which allows for super fast, easy and comfortable suspension geometry setting. This XRAY concept was first introduced in the very first XB8 and now has been carried over to the XB9 platform. Suspension arms are one of the most important parts of any RC model car, as they directly influence the handling and racing characteristics of the car. The XB9 suspension arms are the result of long-term tests of different designs and layouts. Length, thickness, flexibility, geometry of suspension points and materials used… these are all the concepts and details that had to be thoroughly reviewed to create the optimum suspension arms. Based on extensive knowledge gained from the previous XB series cars, several different suspension arm designs were tested in both virtual reality and in-car to find the final best design. The exclusive composite mixture used for suspension arms is a perfect balance between reliability and performance. The suspension arm itself is rigid enough to provide a responsive feel, yet soft enough to survive extra-long main events. The uprights were designed to have a smaller design with less weight. The lower roll center position features 2 positions while the upper roll center positions features 3 different roll center positions. The tiny size of the upright was achieved by using new lighter ball-bearings. The inner bearing (13×19) carries a heavier load where the CVD drive shaft outdrive rotates while the outer bearing (8×14) is newer & lighter than previously used to reduce unsprung weight. The two ball-bearings are further away from each other which provides more stability to the mounting and holding of the wheel axle. To adjust the track width optional offsets are available 0mm, +1.00mm and +2.00mm. A full set of 24 high-speed, blue-sealed ball-bearings are used throughout the drivetrain to ensure maximum efficiency. All of the bearings are degreased and oiled with Aero Shell® Fluid 12 for maximum smoothness and long life. The XB9 big-bore, long-stroke shocks are all of special construction offering increased downtravel, reliability and performance. The XB9 shocks have all the parts fully redesigned and adjusted to the big-bore design including hardcoated shock bodies, reinforced ball-joints, and shock balls with increased movement. Lower shock nut gives superior shock shaft centering. Ultra-precise shock pistons feature 6-, 8- and 10-hole shock pistons. The longer shock shafts and shock collar combine to give increased downtravel. Ultra-fine shock protective rubbers give superior sealing against dirt. The oversized big-bore shocks feature 18.5mm outside diameter shock bodies, externally threaded with an adjustable collar for quick and easy adjustment. The shock bodies are hardcoated, and features a 1-piece alu shock cap. The large 16.0 mmm inner diameter of the shock bodies ensures proper and consistent shock oil flow through the perfectly-round pistons which move very precisely inside the smoothly-finished interior of the shock body. The result is more consistent damping characteristics of the shocks. The shock membranes are wider to fit the big-bore shocks. The material has been also improved to guarantee the same damping characteristics from the beginning of the race to the end even after extreme operation. The lower shock assembly ensures that the shock rod will move very freely inside the shock body but at the same time will minimize oil leakage and keeping the dirt away. Two shock O-rings – manufactured from a superior silicone compound to allow ultra-free movement of the shock rod while still maintaining a tight seal – are installed in the lower part of the shock body and are secured with composite shims. The entire lower shock assembly is secured with the lower aluminum shock cap which makes assembly/disassembly quick and easy. The XB9 springs have been specifically designed to complement the big bore shocks. Bump steer is easily adjusted by inserting shims between the steering block and steering linkage. The front and rear braces have significant influence on chassis stiffness and chassis flex and as such have great impact on car handling under different grip conditions. The XB9 features the well-proven stiff composite braces for front and rear. These braces are more than up to the task… strong enough to hold the car together after heavy jumps or crashes to avoid tweak or breaking, yet still flexible enough to generate the needed grip. The optional longer rear chassis brace #353089 increases the stiffness in the longitudinal direction and makes the car more flex to the sides. Access to the center differential is super easy by releasing the upper deck with only four screws. The lower center diff housing is sized to accommodate optional spur gears and the stands are lowered to keep the weight as low as possible and to allow smaller central diff gears to be used. The center diff housing stands hold the effective and race-proven brake system. The XRAY XB9 features the well-proven high-performance braking system that is so strong and precise and dependable that is makes slowing and stopping effortless. Coupled with the car’s balanced load distribution, the extraordinary control imparted by the braking system give you complete confidence as you pitch the car into the corner. XRAY focused on all of the smallest details when designing the brake system. The laser-cut, precision flat-ground steel brake disk allows fade-free braking in conjunction with the special high-grip brake pads installed on the laser-cut brake plates. The brake disk is small, slim, and very light. The precision hand-grinding allows true, wobble-free rotation. Brake inputs are transferred precisely to the brakes thanks to the rigid high-precision machined brake cams. Both brake disk and brake pads are specially heat-treated for maximum lifespan. The engine mount has been specifically designed to extend up to the front engine bearing to provide higher reinforcement of the chassis in the longitudinal direction and in jumps will minimize the bending of the chassis between the clutchbell and spur gear. Anti-roll bars are manufactured from spring steel material and are included to stabilize the car at both front and rear. The roll bars are easily mounted to the diff cases and can be adjusted through the adjustable linkages. The improved design for mounting the new high-downforce body features 2 rear body mounts and 1 front body mount. Provides increased body stability. The XB9 includes premium HUDY Graphite Grease which is a high-performance, advanced-technology semi-fluid lubricant which incorporates both extreme pressure additives and finely-dispersed graphite for load carrying. It is intended primarily for the lubrication of rotating parts and loaded gears. In addition to providing outstanding load carrying, it is formulated to have excellent adhesion and resistance to “fling-off” under extreme conditions. The grease reduces wear and increases parts life. The high performance low profile aerodynamic body was designed by XRAY to perfectly fit the XB9 and to work in most track conditions effectively. The front and rear of the body have been designed to provide downforce for maximum stability of the car. The body sides as well the cockpit sides are as flat as possible to allow the air flow around the body for the side stability of the car. On the top of roof two flow channels are incorporated for proper air flow. The body is made from high quality premium Lexan material. The high-downforce body is great for majority of track conditions as it generates more traction. However for some particular track conditions, especially when the track is very damaged with a lot of holes, a reduced downforce body should be used. The new optional #359708 Low Downforce body should be used in these situations. Stylish and effective rear wing was designed to provide the appropriate amount of downforce and generate required stability for the car. The rear wing was designed to work perfectly with the original high-downforce XRAY XB9 body for incredible handling and stability. Made from strong special composite mixture the wing will survive majority of abusive and extreme crashes and will keep the shape. Rear wing holders are strongly constructed and offer different wing mounting positions. Made from special composite mixture to withstand abusive crashes. That is one really ugly Lexan body….